Discussion in 'Gear For Sale / Trade/ Wanted' started by guitaardvark, Jul 2, 2018. Brief & Accurate Description of gear/guitar: 6 string set of BKP Blackhawks. I had them installed in my guitar to find out that my guitar has the world's shallowest routing and they don't fit because of the thicker bobbins. Still plenty of lead left. Modifications (if any): I filed down the corners of the mounts to fit into my guitar. Shouldn't affect installation on any other guitar. Also willing to trade for other nice 6-string sets conducive with the prog rock/metal sound. 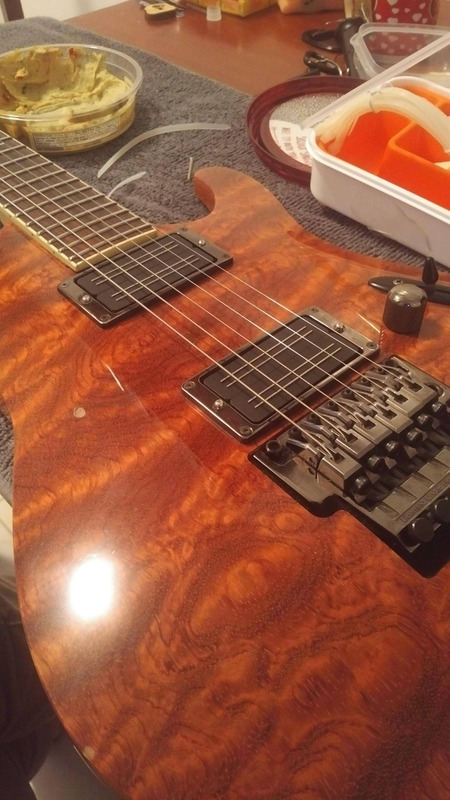 Any of the Periphery guys' pickups, SD Hyperions, etc. Show me what you got! Update: Went ahead and installed them in another guitar just for the hell of it. They're a bit too aggressive for my purposes; BKP was not kidding when they said that they have the output and aggression of an active. Hit me with your passive trade offers! Really jonesing for some DiMarzio Titans, less aggressive BKPs, etc. Further update: I've scored a set of pickups so these are now only for sale unless you have SD Hyperions. To be honest, I can't say with certainty as I bought them used and the seller didn't specify. Going off of the samples on the website, I'd say they sound closer to the ceramics. I can upload a sample if you'd like. Bump with a sound clip! I'll be removing them tonight so I'll see if they say whether they're ceramic or alnico. Bump! Send me your offer! Bumpin'! Willing to knock off a good amount for anybody in the Long Beach/LA/OC area. Not in a major rush, but I'd like to see these put to good use. I confirmed with BKP that these are Alnico. Bump! Still for sale and will take any reasonable offers! Bump! Will do partial trade for either a Titan neck pickup or any DiMarzio tele neck pickup!